The Spiro Mound site has produced many unique artifacts. The engraved conch shell cup in this picture is a nice example. 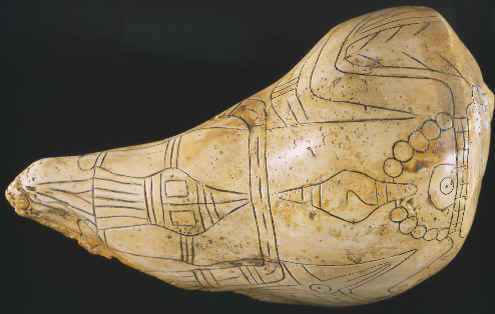 The most important and extraordinary finds from Craig Mound are the shell engravings. The multitude of images the engravings portray are the best written visual history left behind on a single site by any Late Stone Age culture in North America. The Phillips & Brown project of recording shell engravings from Craig Mound lists well over 1,400 complete examples and fragments of cups ("conch shell dippers"), gorgets and other small miscellaneous pieces. The Peabody Museum Press published the study in "Pre-Columbian Shell Engravings". Organic materials, like shell, don't last as long as artifacts made of stone. Most of the artifacts that were made by prehistoric people were made of organic materials like wood, antler, bone, feathers, ivory, etc. Only a tiny percentage have been preserved. The farther back in time they were made, the less likely they are to have survived. The loss of such a large amount of these fragile materials that were encountered in Craig Mound has been disturbing for many people. When the Pocola Mining Company needed more people to dig the main cone of this huge mound they hired coal miners. Rather than dig craters from above in the vast area of earth on the main cone they decided to gamble with digging one large tunnel through the center and, as reported, "hit pay dirt." This tunnel was large enough to get a wheel borrow through but other tunnels were much smaller. They eventually dug many tunnels that honey combed the area inside the largest cone of Craig Mound. What is amazing is they never used shoring in these tunnels and no one was ever injured from a cave in! 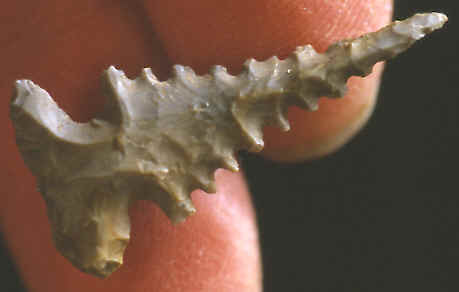 These points were all found in Craig Mound. There are several different types represented here. The one in the center measures 2 inches long (51mm). The significance of what was happening at Spiro didn't become known to the scientific community and to people outside the local area until artifacts began to be sold on the eastern antiquities market. Forrest E. Clements of the Department of Anthropology at the University of Oklahoma first heard of the site and the large numbers of unknown types of artifacts in December, several months after digging had begun. At first, many believed the artifacts might be forgeries but they soon realized this was a major archaeological find. Other professionals such as Thorne Deuel, chief of the Illinois State Museum, and Robert E. Bell, who later became an archaeologist, visited Craig Mound during its destruction. Robert Bell was instrumental in documenting large numbers of the artifacts found there. 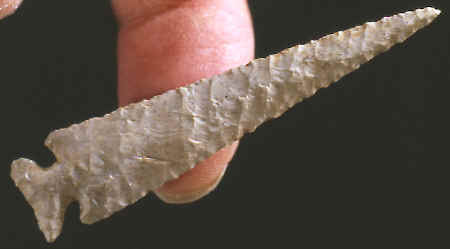 This point type was named by David A. Baerreis after the Reed site in northeastern Oklahoma. It dates to between A.D. 900 and A.D. 1400. 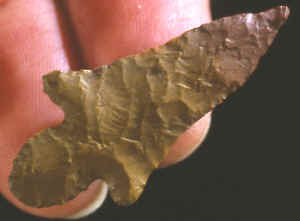 It's one of approximately 35 point types that were found in Craig Mound. It didn't take long for many people to realize there was a need for some type of state law that would have control over or prevent such blatant destruction of important archaeological sites in the future. In the spring of 1935 the Oklahoma legislative past an antiquities act. Prior to this Clements was trying to slow down the diggers. He tried to buy them out with a handsome profit but was unsuccessful. But he was successful in keeping their main digging activity away from the main cone for awhile. The diggers paid no attention to the new law until the deputy sheriff paid them a visit one day in the summer of 1935. After they were informed of their illegal act of digging and "several threats of mayhem" they gathered up their tools and left. The most important area within the highest cone of Craig Mound was far from being dug out. Everything was look-in good. These points were dug from Craig Mound by the Pocola Mining Company diggers in the mid-thirties. Approximately 5,000 stone arrow points were recovered from this mound. At this point the main cone on Craig Mound was pretty well intact and Clements believed the battle was won. So, not worrying about the sites destruction anymore, he took a summer teaching appointment in California and left. Most of the people who lived in the area were living within a rural community and they were not interested in new laws from the big cities that put more controls on their land and archaeology was not an important issue. No one really cared to enforce the law so when everybody left and Clements wasn't around to check up on things the diggers moved back in and finished out their lease which ran until the end of summer. This could be a stylized version of a Morris point. It's artistically and skillfully made with serrations, a delicate and fragile point and nice corner notches. He must have been devastated when he discovered his mistake of believing every thing would be ok after the diggers were told to leave by the deputy. Nothing was left. The destruction was almost complete. He wrote "the great mound had been tunneled through and through, gutted in a frenzy of haste. Sections of cedar poles lay scattered on the ground, fragments of feather and fur textiles littered the whole area. It was impossible to take a single step in hundreds of square yards around the ruined structure without scuffing up broken pieces of pottery, sections of engraved shell, and beads of shell, stone and bone." The main tunnel entrance into the large mound was later blown-up with explosives after the Pocola Mining Company left the property. No one seems to know for sure who closed the tunnel. It may have been done for the purpose of closing off the dangerous tunnels that were still inside the mound. Many Alba points were found in Craig Mound but since no one ever counted all the different styles as they were dug we'll never know how many were found. One group of 3,000 arrow points were reportedly found in a single cache and sold together to one dealer. By this time, newspapers such as the Kansas City Star, were beginning to write exaggerated stories that compared the Craig Mound, now being called "The Great Temple Mound", to King Tut's Tomb. These stories served, for a time, to inflate some of the prices of artifacts and more diggers and dealers were bidding against each other to George Evans to acquire a new lease from the owners of the "Great Temple Mound". Clements writes "tales of pearls by the bushel began to circulate. One man declared that Tiffany's in New York had valued a quart of Spiro pearls at half a million dollars". Fakes also began to be turned out in large numbers. All the points in this picture were dug from Craig Mound. Several different types are represented. Such as Morris, Sequoyah, Hayes, Sallisaw and Alba. The one in the center measures slightly over 2 1/2 inches long (64mm). By this time the digging of the "Great Temple Mound" had become more of a legend. It actually became many things depending on who was telling the story. The professional community saw it as a tragic loss. On the other hand there were many people who had no interest in science and saw the mounds only as a place to find treasure. Many of the stories being written were exaggerations and embellishments of previous stories. Since so much of the excavation was done in secrecy people were writing their own accounts of what was inside the burial chamber. A comparison was made with King Tut's tomb complete with the curse and this was connected with the three deaths that happened during the two years of digging. They were R. W. Wall who was found drowned in a shallow stream, James Craig who "died in the shadow of the mound" with Tuberculosis and a country lawyer who opposed the antiquities bill and died unexpectedly just before the vote. A lot of the information written about Craig Mound is not accurate. The focus of most of these stories centers around the "central tomb", "kings tomb", "chiefs tomb" or "central cavity". This Sallisaw point is an especially well made example. 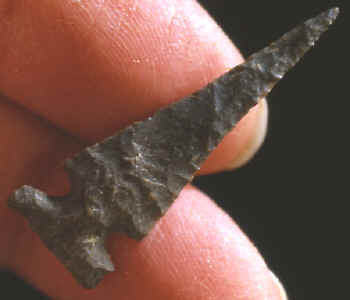 It's larger and more skillfully made than a majority of the arrow points found in Craig Mound. The University of Oklahoma began a systematic excavation of Craig Mound in 1936 with the WPA to try and work out some of the mysteries surrounding the first excavation. Their excavation lasted for three years completely removing the mound. One of their goals was to learn as much as possible about the small cedar log structure known as the central cavity. So many exaggerated stories had been written they wanted to know for one thing, how large it may have been. Clements wrote that the University's excavation found an irregular cavity that varied in size from 15 to 20 feet wide and perhaps eight feet to the center of the roof. But the diggers tools marks were "thick over the clay-like walls". The diggers had removed the cedar logs and extended the size of the original cavity. Two estimates of the size of the central cavity was given by the Kansas City Star and Glen Groves. Both said the opening was tipi (tepee) shaped and 14 feet in diameter. Clements estimated 30 cedar poles had been left behind by the diggers. Later analysis of the hard shell clay walls inside of the cavity showed that it contained 39% lime by volume. Rather than the clay having been tamped into a hard shell surface, it's now believed that percolating minerals accumulated on the walls and considerably hardened the surface. Volumes of books have been written about Craig Mound and the artifacts found there and volumes more will be written. If there is a moral to the story it must have something to do with Clements leaving for the teaching job in California and trusting that everything was going to be ok.
1952, "The Spiro Mound," The Missouri Archaeologist, Vol. 14, October, by Henry W. Hamilton. 1975, "Pre-Columbian Shell Engravings From The Crag Mound At Spiro, Oklahoma", by Philip Phillips and James A. Brown, pp. 1-7. 1996, "The Oxford Companion To Archaeology", by Brian M. Fagan, pp. 686.